in pale per pale or and argent. The two earliest books of special interest to O'Briens were prepared by their own chroniclers and are named "Cogad Gaedhil re Gallaibh" (1016), The War of the Geal and the Gall, and "Caithreim Tordhealbaigh" (1276), The Wars of Turlough. They provide us with several picturesque narratives of Thomond from the rise of the Dal gCais and their numerous warlike engagements and touch on aspects of rural life until well into the 14th century. Regretfully, our rulers at that time wasted their efforts to internecine warfare when it was felt they should have been forming a reunited front against the common enemy. The ruling branch of the Dal gCais gave four bishops to the See of Killaloe in the early years following the Synods of Rathbrassil and Kells; Bishop Donnachad, who rules from 1161 to 1164 and Bishop Constantin from 1179 to 1194. Later on Doniatus and Toirbhealback Ó Briain assumed the episcopate in the second half of the 15th century. At a time when Irish and English political affairs became more closely interwoven, members of the family continued to participate in public affairs and in the military administration of the country. John O'Donoghue, who compiled the valuable "Historical Memoir of the O'Briens", stated that "a connected history of the leading family of Celtic stock and its fortunes would better illustrate the condition of the country then could be obtained from the many unrelated pieces of history." In this regard the Revd. Patrick White, Parish Priest of Milltown-Malbay, has left us an enduring study of the different roles played by the members of the family on aspects of Irish life down through the centuries in his well-known "History of Clare and the Dalcassian Clans" first published in 1893. A mass of printed material relating to the O'Brien estates, family affairs, household accounts, documents, deeds, invoices and letters are now preserved in the National Library of Ireland and these have been edited by Sir John Ainsworth under the general title of "The Inchiquin Manuscripts". Also in the National Library (MSS 14503) is a holograph book of the O'Briens containing much information on Co. Clare families compiled by Sir Robert O'Brien, younger brother of Sir Lucius O'Brien, who was M. P. for Ennis for 14 years. Historically -minded members of the family have from time to time been drawn to the subject of their ancestry and their place in history and have put pen to paper to record their vicissitudes. The Hon. Donough O'Brien spent much time in the preparation of "A History of the O'Briens" from Brian Boroimhue A.D. 1000 to 1945, which contains several interesting reproductions of the well-executed paintings which adorn the family portrait gallery in Dromoland Castle. Many other informative features have appeared in our local historical journals in recent years, such as "Some matters touching on Dromoland", an examination of the correspondence between Sir Edward O'Brien and his son Lucius, edited by Professor Leo. F. McNamara of the University of Michigan. 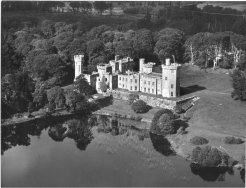 Another original article of particular interest entitled "Dromoland wives", has been contributed to "The Other Clare" by the Hon. Grania Weir and treats of the wives of the former Barons of Inchiquin, their family background, interests and pursuits. "O'Brien of Thomond: The O'Briens in Irish History 1500-1865" compiled by Ivar O'Brien is a handsome book with illustrations and extensive bibliographical notes and references together with the pedigrees of the five principal branches of the O'Briens. Ainsworth, "The Inchiquin Manuscripts", Dublin, Irish Manuscripts Commission, 1961. Mac Craith, Seán, "Caithréim Thoirdhealbhaigh". Dublin, 1929. McNamara, Leo. F. "Some matters touching on Dromoland" in the "North Munster Antiquarian Journal", vol. 28 (1986). O'Brien, Donough, "The history of the O'Briens from Brian Boroimhe: A.D.1000-A.D.1945. London: Batsford, 1949. O'Brien, Ivar, "O'Brien of Thomond: The O'Briens in Irish History 1500-1865". Chichester, 1986. O'Donoghue, John, "Historical Memoir of the O'Briens", Dublin, 1860. Weir, Grania, "These my friends and forbears". Whitegate: Ballinakella Press, 1991. Weir, Grainne, "Dromoland wives" in "The Other Clare" vol. 13 (1989). Weir, Hugh, "O'Brien, people and places". Whitegate: Ballinakella Press, 1988. O'Donoghue, John, "Historical memoir of the O'Briens: the origin and history of the O'Brien clan". Dublin : Hodges, Smith, & Co, 1860. Reprinted by Martin Breen, 2002.